July 9, 2014 By Tina M 129 Comments This post may contain affiliate links. Read my disclosure policy here. I’m so excited for today’s post! My friend John has self published several coloring books, and he offered to make a free coloring printable exclusively for Mother’s Niche readers! Awesome, I know. The fun thing about these Geo Patterns is that they are fun for a wide range of ages! 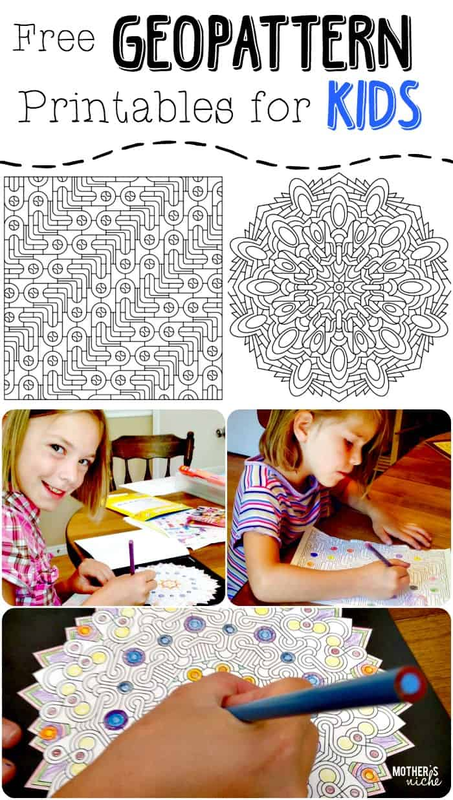 They work great for kids that are learning how to color within the lines, but they are also wonderful for kids that are growing out of the “coloring stage” because they have so many fun & complex patterns and there are so many different ways to color them! My favorite part about the coloring books was that they were entertaining for BOTH of my nieces even though they are 5 .5 years apart in age (ages 10 & 4). It can be hard to find activities with such a broad age range! Click on the images to download your free coloring printables! Keep in mind that these samples John has created for free are a little less detailed than the originals, so if your kids enjoy them, they will really enjoy all the real versions! Seriously – do I have to choose? If so, I choose all of them! 😉 My Nathan (6) would literally die over these! Thanks for the chance to win! Congrats Pam! John decided to give out coloring books to 6 runner-ups and you were one of them! You won the GeoMandal2! Please message me your mailing address! Geomandala or geomandala2…they look like so much fun!!! Definitely for me! I really want the pens they look sweet but Geopattern Enhanced looks cool too. These books look wonderful. I know my 5 children would love to color the pages. I love the geopatterns book. This would he for all 5 of my kids. I know they would all love them! I like the Geomandala coloring book! I’d be winning this for my munchkin man and myself! I love all the coloring books. I’d hope to win these for my daughter, so we can color together. The Geomandala looks super cool. I think my son would enjoy these. They are all intriguing; however, I think most of my eleven grandkids would LOVE the Geopattern book. What a cool collection! Oh I really like the Geomandala one. So pretty. I would give these to my little girl. She would have so much fun. So cool and fun!! I like the GEOMANDALA coloring book! I like geopattern the best but all of them are cool! My toddler’s eyes lit up when she saw the photos of kids coloring! My 6 year old daughter would love the Geopattern Enhanced book! She LOVES to color patterns 🙂 These are so cool and thanks for the free printables! Geopattern Enhanced! I would love to win this for my 4 nieces and nephews ages 5-12. We are going on a road trip out west for 10 days this summer and they would really enjoy keeping busy with these! I love the Geomandala patterns! My grandsons would love these. I think I would have fun coloring them too! The Geopattern looks great. These would be for my two sons. Thanks! I love those Geomandala books! And Prismacolor colored pencils are all we use, so that would be a bonus if I won. I would love the Geopattern enhanced coloring book. They are all beautiful but if I had to pick just one this would be it. My kids and I would have tons of fun. Thank You. Congrats Erin! John decided to give out coloring books to 6 runner-ups and you were one of them! You won the GeoPattern! Please message me your mailing address! With 5 coloring-crazed kids and one color-loving mama in this house, we’d all love any of the books, but probably the geopatterns enhanced would work best for my crew right now. the geomandela is my favorite of the coloring books but really its a close tie between them all. And my kiddo would love them!! Geomandala 2 looks so awesome! GEOPATTERN ENHANCED looks amazing. My 6 year old son and I would love to share it! GEOMANDALA What fun! Great five away! Such fun to come visit your site. I love the Geomandala Enhanced Book!! SO much fun for the kiddies! These are beautiful patterns! I like the Mandala books the best. If I win, my kids will get a couple of books but I’d take the rest for my classroom. GeoMandala Enhanced looks really cool. I can see my 6 year old daughter and I working side by side! I love them all! I have two small ones at home-ages five and two-and I teach third graders. I would find a use for every. Single. Item! I remember these types of coloring books when I was young – brings back such wonderful memories!! I have to say they all looked like just as much fun but I like the Geomandala series best. They would make a great center in my classroom. Thanks for the opportunity to win – good luck to all! Seriously! Too tough to choose just one. My kiddos, ages 10 and 5 would flip over these books. My oldest is already interested in creating Mandalas. What a great art activity for he and his lil’ bro to do together. Thanks for the chance to win! Congrats! John decided to give out coloring books to 6 runner-ups and you were one of them! You won the GeoPattern Enhanced ! Please message me your mailing address! Geopattern! I teach 4th grade and I really think my students would love these. Geomandala. I want to win for my grandma, who recently started to color mandala coloring books and it is improving her dementia. I bought her about 5 books and she finished them all so quick! I like Geomandela, and it would be great to win it for my grandchildren! I think I love the Geomandala 2…. so great. I need them! I really like the Geomandala 2 book. Looks awesome. You can use it will lots of kids of all ages. I want to win it for me to use when I need to relax and refocus. I like the Geomandala best. I know my grandchildren would enjoy them when they visit. They are all wonderful Geomandala is my favorite. My twins would love them all. Geopattern Enhanced, maybe? My kids and I would love to sit for hours working on these! And my oldest 2 have been begging me for their own set of these exact pens. Geopattern coloring book. My grand daughter would love to have these designs to color! I think I like the Geomandala books (although all are wonderful)! I teach elementary school and these are great to use as short in between activities….kids love them! Too hard to choose. These are my favorite pens and colored pencils too. Amazing! I really like those coloring books. It relaxes me just to think bout coloring them! Geomandala! All 3 of my boys (and myself) would love to design pretty colored shapes! Geomandela Enhanced looks cool and the pens are amazing!!! I can’t pick just one! I love to color, especially intricate mandalas and geometric shape patterns! Love them all! My girls, 11 and 12, would love any of them! I would enjoy coloring in them. It would be very therapeutic! Wow they all look amazing! As well as the pens. What stood out to me is the geomandala!!! Geomandala Enhanced looks really cool and I’m pretty sure my almost 16 yo son would love them. Geomandala would be perfect for my two girls, 9 and 7. What great patterns. Love the mandala. Love them all! This will be for my 5 years old granddaughter. Thank you for the opportunity to win this awesome prize. I Iike the geopattern enhanced!! Thank you for the free printables! I printed one for my girls and one for me! Love this! Geomandala and/or enhanced. We do frequent coloring with Mandalas in my practice. As a trauma informed child/adolescent psychotherapist, I see that children can talk more freely if they are engaged with an activity using eyes and hands. Oh wow! Not sure I can name just one but I love the Geomandala! thanks for the opportunity! The GeoMandala Enhanced. Wow. Would love to win the package for my grandchildren. My 8 year old would LOVE these! I really like the geopattern enhanced. I love these. I seemed to always doodle these types of images on my folders way back in the days when I was in school. I found this type of art to be very soothing! I would like to win it to give to my granddaughters to enjoy too! Maybe they have hidden art talents like I did! Congrats Ann! John decided to give out coloring books to 6 runner-ups and you were one of them! You won the GeoMandala Enhanced! Please message me your mailing address! they would all be great and I know we would have a blast with them! Love the geo mandala 2 and the color pencils are supper. Thanks for the giveaway. I have an aspiring artist who won’t play sports or anything else. She would LOVE any of these! I’m excited to show her! Thanks for the post. We never would have known! The Geomandala Enhanced…. my girls would love this, and it would keep them busy. My daughter would love Geomandala Enhanced. She loves art and coloring. They are all perfect!! My daughter will love them!! This is definitely for me. Still love coloring. All of them look soo much fun. I can’t pick just one. These look great. I especially like the Geopattern 2. The whole family would likely share these. Geomandala 2! And this would be for my 8yr old little artist! Maybe she’ll share with mom..? Congrats Mary! John decided to give out coloring books to 6 runner-ups and you were one of them! You won the GeoMandala! Please message me your mailing address! Geomandala2 For my 9 and 7 yr old daughters. I would enjoy coloring them too!! Geomadela Enhanced – why not get the best of two. My grandniece will be visiting me from Germany and she loves to color. This would be great to entertain her, Thanks for the opportunity! Thanks Everyone! This giveaway is now close. Winners will be announced Saturday! Is it closed? It says giveaway ends July 18 🙂 I would love the Geomandala2 for myself!!! All of them! My daughter would love these. GeoPattern Enhanced is my favorite! I love to color and draw and including my kids in these activities is important to me. I like to color when I am stressed or worried about something. Do I really have to choose? I love all of them! My boys (9 and 7) would love these. Geomandala looks super cool! I would love to use these in my classroom! The enhanced Geopattern one is so cool! Did the winners get announced? Yes! Just barely 🙂 Sorry for the delay! I’m probably too late? Your reply went to my junk mail 🙁 if I’m not too late how do I get you my address without it being posted for all to see? Just click on “contact” from my main menu and message me through there! 🙂 you’re not too late, I actually just wrote down in my planner to pick a new winner tomorrow! I just wanted to mention that this was my very first giveaway and it’s been really fun to read all the comments! Kristina has been great to work with and it’s a wonderful blog. Here at home we’ve already tried the garlic roasting as we’re garlic lovers too. My daughter Lydia liked the article on things to do in Utah and has added it to her list of places to visit. She’s been to several States already because we drive around a lot so we may actually get there sometime in the next few years. I hope you all enjoyed participating in the giveaway and I truly wish I could pass my books out to everyone who would enjoy them. * Thank you all, and special thanks to Kristina! Perfect! I knew I had pinned some cool colouring in for one day and here it is – Thanks! GeoMandala Enhanced – I’d give it to my preteen for Christmas. Geomandala2 looks fabulous. My daughter and I would both love it! Geopattern Enhanced. I have 3 grandchildren that would love these. Thank you for this opportunity. I like the geomandala enhanced. I find coloring incredibly calming. My kids not so much but i think seeing me enjoy that peace could totally bring them around. I like the Geopatterns 2 book, alot! However, picking a favorite is impossible! I am hoping to win this for myself, as I love to color, and it helps relax me and not feel so lonely. Thanks for the opportunity!